Keep current with what’s happening at the Ford School! 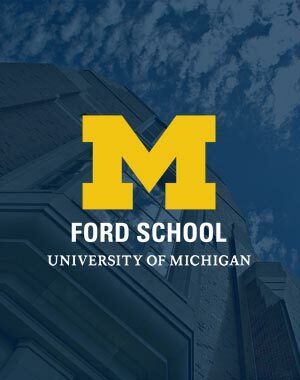 Connect with us on social media to join Ford School public events, reconnect with old classmates, network with fellow policy professionals, and share your own good news. LinkedIn : Our LinkedIn group is a great way for alumni to strengthen and extend their network of trusted, professional contacts. Twitter : Follow us on Twitter to get brief, real-time updates on faculty, students, alumni, and Ford School programs. Facebook : Like or follow us: get the latest news and events, view photos from past events, and connect with others. Flickr : Explore and download photos from dozens of Ford School events on our Flickr page—events feature students, faculty, alumni, and visiting speakers. Instagram : Get an insider's view of life at the Ford School. YouTube: Watch past events from the Ford School, including policy talks, lectures, and student presentations. Sign up to see a weekly aggregate of all the Ford School's news and receive updates about upcoming events.